The latest addition to our family has been on the Logicam II production line since 25 February 2016. I’m gaining a better understanding of why most of you come to visit us so frequently during the construction period. Because it feels a bit like a pregnancy. Waiting for the baby to arrive. The guys on the shop floor start to laugh when I come yet again with iPhone in hand to take photos. I take pictures of every angle, hose, cable and component. I have now taken 139 photos – from the “lump of steel” to the present. The boat is currently at workstation 1, so it’s going to be a thick album! The name goes on… “Henri Mer” and now it’s real. It’s no longer hull number 3293. No, it’s “Henri Mer”. And it’s ours. I often ask you for “the story behind the name”. So now it’s my turn to tell you that story. Long ago, the family had a small boat. That boat was called “Henri Mer”, a pun on the delicious wine from the “Henri Maire” domain. “Maire” became “Mer”, i.e. a combination of water (sport) and wine. Because they apparently go well together… I have many happy childhood memories of the boat and so our grand sturdy 410 AC also became “Henri Mer”. Mathijs is looking forward to it already. This is because, before the yacht goes to Kinrooi for chartering, we will be sailing it ourselves with the kids on board, followed by Ruben and his family for a further week. We’ll let you know how things turn out. And where we have been. Just look out for “Henri Mer” this season. You’ll see Ruben or me with the family on board sometime in July/August. Then it will really come to you, Luc and Arlette. Its chartering life will begin from that point onwards. I hope all the guests on board will treat it with as much love as we have and will have a lot of pleasure on board. Why are we chartering? It’s very simple, we have too little time to sail ourselves but would still like to have our own boat. We reserve 2 to 4 weeks each year for ourselves and, for the rest of the time, we’re happy for it to cruise around with other boating enthusiasts. This is an easier way for people to become familiar with sailing and check out whether it really is fun on the water. Of course, you and I have long known that it’s really great. But it would be good if we could persuade even more people to sail with us. Preferably on a Linssen. But I don’t have to explain that to you either. The yachts do that themselves. And so we’ve come full circle. 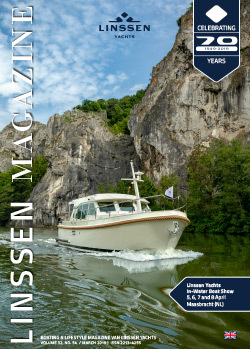 Charter first – find out what it’s like and then ….. join the Linssen Owners Group NL/B, Linssen Yachts Eigner Vereinigung, Linssen Owners UK Association, Linssen Club Schweiz, Linssen Owners Club Finland or “just” the large international Linssen family! I wish you all an enjoyable sailing season! PS. Unfortunately, I haven’t yet had a reply from Legoland.